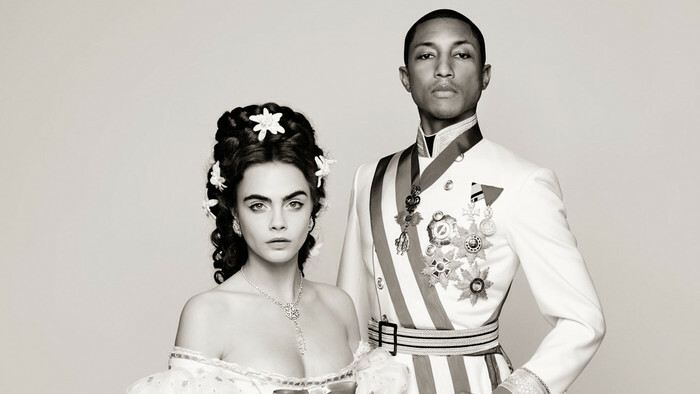 “Reincarnation” is the latest Chanel film signed by Karl Lagerfeld that tells the story of the birth of the famous Chanel jacket .Starring Cara Delevingne, ethereal as Sissi in an Austrian castle with Pharrell Williams as her royal knight, playing Franz Joseph. And with a leap in time the story takes us to 1954, to an episode in the life of Coco Chanel: when the fashion designer, on vacation in Austria, was enchanted by a jacket worn by the lift attendant at her hotel. That style, revised and updated, became the basis of the famous jacket by Chanel. To celebrate the upcoming Paris-Salzburg 2014/15 Métiers d’art collection, which will be shown on December 2 in Salzburg, Lagerfeld took the occasion to recall the story of Sissi and Franz Joseph. A rock fairy tale , that launch also the song “CC the World” sung by Cara andPharrell. For nowthere is the just the “teaser” video of the short thatwill be presented on December 1 chanel.com. I read about this yesterday and thought it was awesome! Can’t wait to see the whole film. That was stunning! I lover Lagerfeld’s movies. Admittedly some of the plots I’m confused with however I adore the outfits and how they represent the characters.